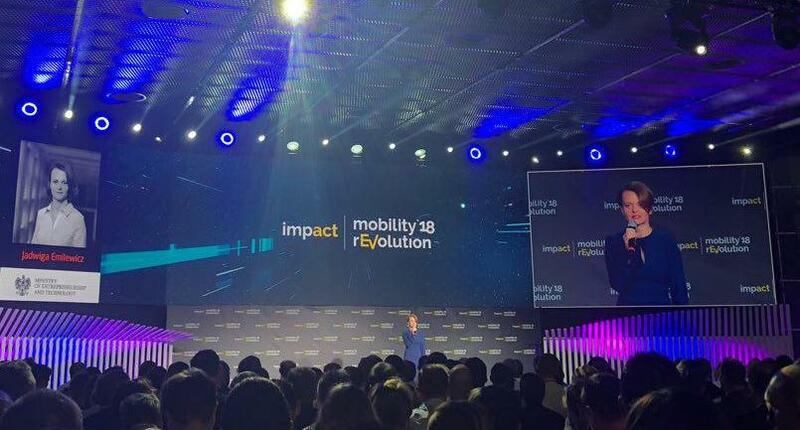 A congress devoted to electromobility, Smart City and innovations in mobility – Impact Mobility – reEVolution began in Katowice. – Exactly 102 years ago, Henry Ford released the iconic Ford T model. I believe that the development of electromobility in Poland will take on a similar momentum as the T model. Also 100 years ago, the 100 km barrier was beaten and it was an electric vehicle. – said Jadwiga Emilewicz, Minister of Entrepreneurship and Technology. Jadwiga Emilewicz said that from January 2016, every week on Wednesday, a meeting of the team of ministers responsible for implementing innovation takes place. She stressed that Impact Mobility is not accidental in Silesia. The automotive industry is developed in this region. – We began to deal with the Responsible Development Strategy, including the development of electromobility. We adopted a legal framework within the framework of horizontal policy, and this year the Act on the development of electromobility, the Low-Emission Transport Fund entered into force – she said. In her opinion, this project aimed to place Poland in a niche of development, innovation, electromobility, and at the same time support the fight against air pollution. – The European Commission is already inviting us to discuss the development of the sector or the battery – she underlined. – Within five years on the automotive market there will be a revolution, not only electromobility, but also digitization in mobility. Already next year, the company will present a base project for a vehicle dedicated to the electrics – said Wolf-Stefan Specht, president of Volkswagen Group Polska. He stressed that the new vehicle plate will allow for quick loading and will be equipped with autonomous systems. – We will electrify our entire transport within ten years – he said. He added that the new vehicle plate will be the size of the Golf model, and the driving comfort will be the same as that known from the Passat. The president added that there will also be a second board for luxury vehicles, so-called Porsche technology. – This board will allow charging of electric vehicles for less than 30 minutes, and its range will be 500 km – he said. He revealed that Volkswagen has already allocated 25 billion euros to prepare electrician factories in China, South America and Europe. – At our factory in Leszno, at the end of this year, we will begin the production of VW Crafter, an electric vehicle – he said. He added that the challenge now is the price, but the ambition is to lower it to the level of other electric cars. He added that the next challenge is loading. – Infrastructure development is needed so that you can load vehicles at night and during work stays. It is also a challenge for us dealers. Encourage opening the charging station. Another example are the stores. During holidays, loading vehicles is also a challenge. We want to invest in 300 ultra-fast chargers – he said.